•	It seems that nearly all people believe, or would like to believe, that they can move in an “upward spiral” (Sheldon & Houser- Marko, 2001) toward ever-greater personal well -being. •	Happiness is the highest on the hierarchy of goals. But what actually helps people experience authentic happiness? Or rather, how can we achieve happiness as an outcome of a life well – lived? Positive Psychologist SONYA LYUBOMIRSKY researched identical and fraternal twins and found that each person is born with a particular “happiness set point” and that there is a baseline for happiness to which we are bound to return, even after major setbacks or triumphs. 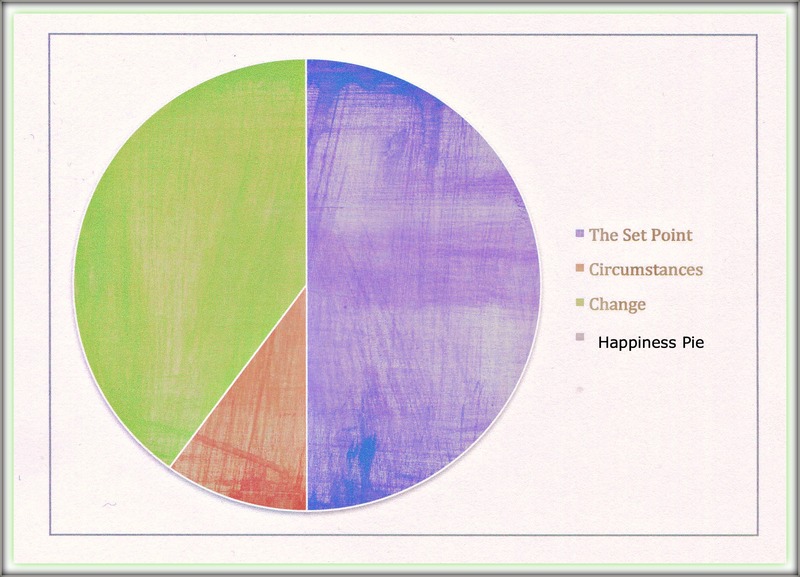 The set point for happiness is similar to the set point for weight. Some people are blessed with a “skinny disposition.” Even when they’re not trying, they easily maintain their weight. By contrast, others have to work extraordinarily hard to keep their weight at a desirable level and the moment they slack off even a bit, the pounds creep back on. •	10% can be attributed to differences in people’s life circumstances – whether they are rich or poor, healthy or unhealthy, married or divorced, etc. •	40% of our capacity for happiness we have in our power to change. If we are prepared to do the work. Here’s 8 Happiness Increasing Strategies (Ken Sheldon, David Schkade and Sonja Lyubomirsky) or what I’ve come to nickname as THE HAPPINESS LOOP – which can be used to initiate, boost and maintain our journey and may even make the quest for meaning, fulfillment and wholeness a little sweeter. 1. CHOOSING AN ACTIVITY: When we personalize the way we spend our time and orient our goals around our (strengths, values, interests and our inclinations) – and when it’s something we love doing and it makes us excited – than it is naturally easier to get started. That’s like saying, if I do one thing that I love – it will have a positive impact on everything else in my life. a. What am I good at? b. Primarily experience based – and what sustains us. I was having a very hard time keeping up with my blog. Constantly feeling stifled by the ‘coach tip & reportage’ format and allowing months go without posting – which was having a negative impact on my business and my confidence. I came across the combinatorial or curation format and recognized my own strengths and love for collecting and creating content, images and stories. I began following several people who are experts in this area and within weeks, I started posting every Sunday and sometimes more frequently. MY new blog is called NOTES FROM THE TRAIL. Although, both extrinsic and intrinsic strengths matter finding intrinsically motivated activities is essential for the person’s ability to initiate and to stay with it. 2. VARIETY: If it becomes boring one must find ways to keep it fresh. I like to stay fit but I don’t like the gym and get bored with rote kinds of activity. But I live on a trail and I use my bike to accomplish every day activities such as grocery shopping, visiting the library and taking photo adventures. I often put in 8-15 miles a week. Just by doing it. A physical workout routine might include zumba and yoga classes and then outdoor hikes or park runs. In a work environment we benefit from having several work projects and incorporating just enough of a stretch (or a challenge) that it requires some skill level and the task is difficult enough but doesn’t cause overwhelm – this is the growth point. Despite its status as the Motor City, Detroit has only two automobile plants entirely within the city limits. One is Chrysler’s Conner Avenue Assembly Plant, which reopened in December after being closed for more than two years during the automaker’s bankruptcy. Later this month, the factory’s first Viper — considered a “halo” vehicle, built to enhance a company’s image rather than drive sales — will roll off the line. A worker at Conner, Mike Chapman, says that “you’re more like a craft person than a line worker” there, while at other plants “you’re pretty much like a robot.” Elsewhere, workers spend less than a minute on each car; at Conner, they spend a half-hour on each car. And with almost no automation in place, the loudest sounds are the roars of a Viper’s engine. In their classic social psychology study the experimenters recruited 67 students from the Princeton Theological Seminary and told them it was a study about religious education and vocations. Unknown to the study’s participants, they were to experience their very own ‘Good Samaritan’ test. For after filling out their questionnaires and while making their way to the other office to give their talk, they would encounter an experimental confederate lying in a doorway, doubled over, eyes closed and coughing. Participants would have to pass the apparently highly distressed man, but would they stop to help? This created three conditions: high, medium and low hurry. So some students left the office thinking they needed to go quickly, others less so, while some were relaxed. When we don’t have time to think and reflect we conform – our lives are on auto pilot and we no longer act on purpose. 4. 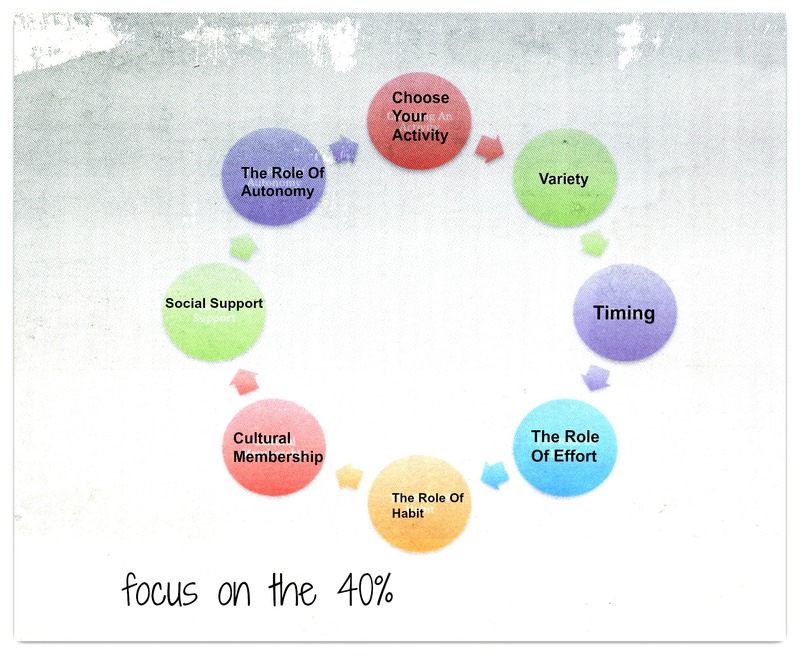 THE ROLE OF EFFORT: High human accomplishment is a component of flourishing and well-being. The role of initiating and the role of maintaining an activity can require willpower (I can do it. I am determined to reach my goal.) Will power is a muscle and has a limited capacity – so the role of intrinsic interest (what I love doing) and way power (this is my plan. Here are alternative ways to reach my goal.) plays an appealing and easier part in jump starting a goal. Perseverance, comes from the latin per, meaning ‘through’, and sever, meaning ‘extraordinary’. To persevere then is to go beyond our regular ordinary way of doing things and to do something EXTRA, something special. Perseverance invites us to pass through what appears impossible on the road to accomplishing extraordinary things. 5. THE ROLE OF HABIT: Initiating a practice which is beneficial and at the same time keeping it fresh and meaningful so that it doesn’t lose it’s value and it’s thrill. Ritual gives the role of habit MEANING and great staying power – and as the saying goes, the secret to our future is hidden in our daily routines. One of my favorite mentors, Coach Dave Buck, shares his sentiments on the habit of work vs play. THE WORKER MINDSET looks like this: Sit down. Do what you are told. Complete your tasks (perfectly.) If you talk with others you are cheating. THE PLAYER MINDSET looks like this: Step up. Stand out. Creatively express yourself. Enjoy doing it. Engage and add value. BED TIME STORIES are a perfect blend between the role of habit and the meaning of ritual. “Storytelling sends the message that children are loved, and that adults have time to spend with them. After bedtime stories, there’s a stage when parents and children also read together, which strengthens bonds. Storytelling gives an insight into different dimensions of life and provides an “anchor” to our cultural traditions.” ~ Anirudh Nair, director, Wide Aisle Productions. 6. THE ROLE OF CULTURAL MEMBERSHIP: A meaningful life is to be in service of others rather than just personal achievement. The act of paying it forward and acts of kindness are at the core of well-being. Amélie is a 2001 romantic comedy directed by Jean-Pierre Jeunet. She has devoted her life to making people happy – secretly she executes complex schemes that affect the lives of those around her. In this scene she escorts a blind man to the Métro station, giving him a rich description of the street scenes he passes. 7. SOCIAL SUPPORT: when going after our dreams and playing a big game or attempting a stretch goal – challenges can arise and one must look for support from their teams mates, friends, family, mentors and instructors. 2. Mastermind Groups or Peer Groups: The Coordination of knowledge and effort, in a spirit of harmony, between two or more people, for the attainment of a definite purpose. 3. Weight Watchers & AA: Everyone is there with the same struggles. It’s a time to be accountable for choices and the membership teaches one how to succeed in the real world of food and alcohol. When you realize you’re not alone it’s easier to stay motivated. 8. THE ROLE OF AUTONOMY: Freedom and providing enough choice as possible and a meaningful rationale when choice is limited. Many, many years ago, on a toy store window across the street from the Natural Museum in NYC there was a sign that said, “DON’T POSTPONE JOY” It’s was a happy reminder that always made me smile – and it also suggests that deep down inside, there is a happiness seeker in all of us. I’ll leave you with the (3)question process which is a simple exercise that helps us to identify the overlap between the the things that we’re good at and the things that we love doing. It is in the overlap where our happiness resides and flourishes. Question 1: What is meaningful to you? What is important to you? Question 2: What is pleasurable to you? What do you enjoy doing? 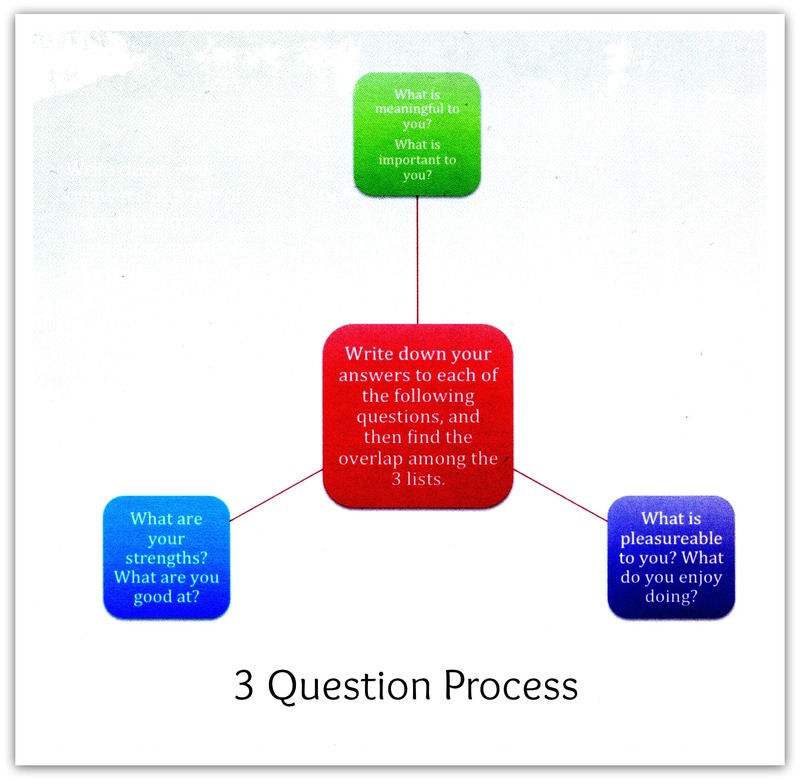 Question 3: What are your strengths? What are you good at?